Posted: 0 Post subject: Ploomette, mc d's g3, g4, FIM calendars. MORE ADDED. 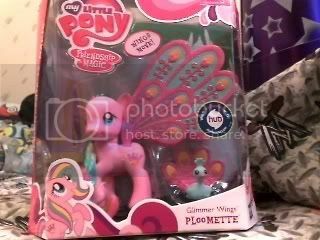 I bought this ploomette tonight, specifically to trade for a tinsel haired applejack from the canterlot set. Also have these mc d's ponies for trade, their hair is messy because i haven't got around to cleaning them up yet but they're all savable. 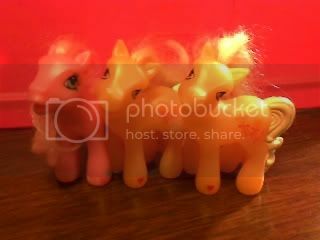 both butterscotch ponies have some paint ware on their tails though but its not too bad. i can take pics upon request. they do need washed still, but i can do that if you'd like. EVERYTHING in my sale's thread is for trade!!! Would love one - is there anything on my sales list you are interested in? 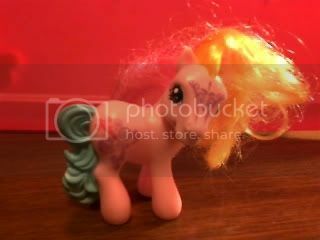 I also have one of the bridal ponies and some accessories that aren't on my list yet if you're interested? 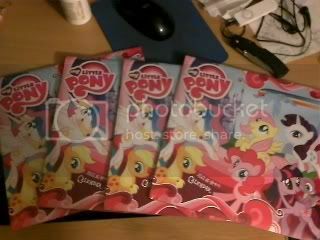 Posted: 0 Post subject: Re: 4 FIM 2012 calendars for trade + mc d's ponies for trade! Have a look at my sales thread (in sig), maybe there's something you like? 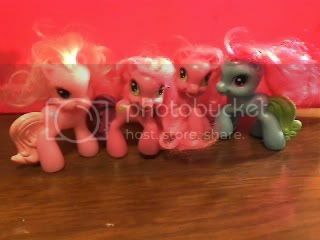 Posted: 0 Post subject: Re: 4 FIM 2012 calendars (2 left) & mc d's ponies for trade! yep!! thank you for trading with me gazzy!! i updated the trade list and everything from my sales thread is now available for trade. those of you who have trades with me who i haven't sent out yet, i will be sending them out tomorrow! would you be interested in trading for either Rainbow Flash/Rainbow Dash MIB or Daisy Dreams/Fluttershy MIB, let me know if you're interested, thankyou. would you be interested in a rarity? i was saving ploomette for the applejack i need. but i think our walmart still has rarity.